NASA Earth Observatory images by Joshua Stevens, using NDVI data from Aqua/MODIS and mule deer habitat data courtesy of Stoner et al. (2016). Caption by Tassia Owen with Mike Carlowicz. Raising a new fawn is no easy task. A mother mule deer needs a lot of food for herself and her growing fawn. New satellite-based research suggests that those mule deer mothers are in tune with their environment, with reproduction patterns closely matching the cycles of plant growth in their habitat. Mule deer need a rich supply of vegetation for the late stages of pregnancy and for nursing their offspring after birth. For this reason, birth rates peak when food sources are increasing, shortly before the peak of annual plant growth. What is surprising is that mule deer in the colder, snowy northern parts of their range give birth earlier in the year than deer in the warmer southern reaches. Through a combination of satellite measurements and ground-based population counts, scientists can see the reason for the difference from space. Mule deer, a commonly hunted species, are closely monitored and counted by biologists and land managers. A great deal of data about the size and health of the population is collected each year in order to determine the proper number of hunting permits to issue. At the same time, remote sensing scientists have a space-based way to track the health of vegetation. It is called the Normalized Difference Vegetation Index (NDVI), which is a measure of the “greenness” of the landscape. NDVI measures how plants absorb and reflect light; the more infrared light is reflected, the healthier the vegetation. So by measuring the greenness of the mule deer habitat, scientists were able to mark the beginning and peak of the plant and deer growing season. 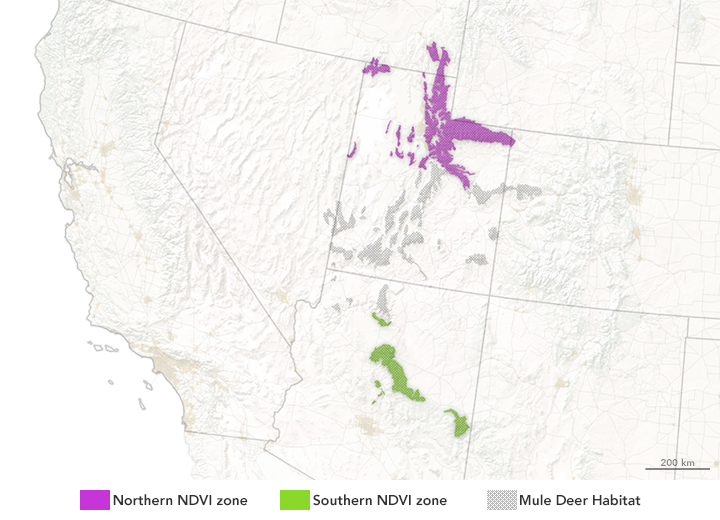 The map above shows the range of mule deer from southern Idaho to central Arizona. The habitat is divided into a green southern zone, a purple northern zone, and a gray transition zone. The mean NDVI for the northern and southern regions is displayed in the graph, which plots the vegetation index for each day of the calendar year. NDVI was measured by the Moderate Resolution Imaging Spectroradiometer (MODIS) instruments on NASA’s Terra and Aqua satellites. According to lead author David Stoner of Utah State University, vegetation greenness in the northern latitudes peaks earlier than in the southern latitudes. Since nutrient-dense food sources were available earlier in the year, there was more food available for mule deer mothers and babies at the time when they needed it most. That greenness is partly a result of a consistent steady stream of snowmelt moisture feeding the deeply rooted mountain vegetation. In southern latitudes, on the other hand, the plants are more dependent on rain from summer monsoonal showers. This means vegetation quality peaks later in the year, after a brief drought that comes before the summer monsoons. As a result, does give birth later in the south than in the north. “This kind of applied research is very important for making remote sensing data relevant to wildlife management efforts,” said Jyoteshwar Nagol, a researcher at the University of Maryland. Deer have a huge economic impact in the United States, from hunting to crop damage to car accidents. As regional climates shift or droughts occur, deer could migrate farther or expand their range to find food. Stoner, D., Sexton, S. and Nagol, J. (2016) Ungulate Reproductive Parameters Track Satellite Observations of Plant Phenology across Latitude and Climatological Regimes. PLoS One, 11 (2) e0148780. Images of Wolf volcano on June 11, 2015. ASTER image (left) shows Wolf Volcano in great detail. MODIS image (right) red marks indicate temperature anomalies or hot spots. Image Credit: Aster image from NASA Earth Observatory by Jesse Allen, using data from NASA/GSFC/METI/ERSDAC/JAROS, and U.S./Japan ASTER Science Team. MODIS image from NASA Worldview. Not every volcano is as closely observed as Mount Saint Helens in Washington state or Mount Kilauea of Volcanoes National Park in Hawaii. These active volcanoes are closely monitored with specialized instruments dedicated to monitoring signs of volcanic activity. They are the exception, not the norm. Many volcanoes are remotely located and poorly monitored. However, NASA’s Terra satellite is helping identify potentially active volcanoes, better equipping surrounding communities to evacuate or take precautions before their local volcano erupts. 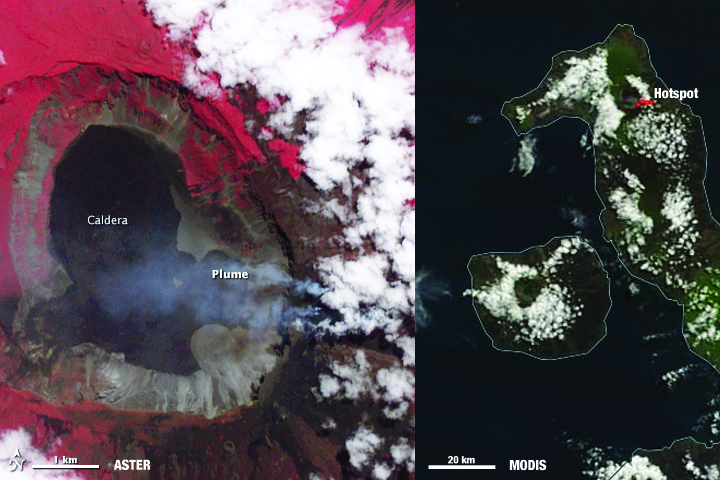 Two instruments on NASA’s Terra satellite, the Moderate Imaging Spectroradiometer (MODIS) and the Advanced Spaceborne Thermal Emissions and Reflection Radiometer (ASTER), along with instruments on other NASA and NOAA satellites are being used to identify and monitor potential areas of volcanic activity as part of the Urgent Request Protocol. Not one satellite can do it all. “Monitoring of active volcanic processes using spaceborne data commonly requires different temporal, spatial and spectral scales depending on the science goal and process being observed,” according to Michael Ramsey from the University of Pittsburgh in his recent article, published on December 17, 2015. Hotspots on Earth are identified by satellite images that have a thermal sensor, which measures the temperature, or infrared radiation, of Earth’s surface.MODIS, the Advanced Very High Resolution Radiometer (AVHRR) and ASTER all collect data on Earth’s temperature, but each of these sensors have different spatial resolutions. MODIS and AVHRR image large areas frequently, but lack detail. ASTER, on the other hand, has high spatial and spectral resolution, but lacks frequency. AVHRR, MODIS and ASTER teamed up as part of the Urgent Request Protocol. AVHRR data was initially used exclusively until 2011, when MODIS data was integrated into the system. AVHRR and MODIS identify temperature changes on Earth’s surface that could indicate volcanic activity. These areas are flagged as being potentially active. When they are flagged, these locations are sent automatically to the Urgent Request Protocol database, where a request is submitted that ASTER look at these locations more closely on its next opportunity. This allows stakeholders to potentially track detailed changes on that site every time ASTER passes. Prior to 2011, scientists manually reviewed flagged hotspots before being submitted to the Urgent Request Protocol for imaging by ASTER. One benefit of using MODIS data over AVHRR is that it allows the system to be automated because MODIS data has less noise than AVHRR and has a higher detection threshold, reducing the number of false positives detected. Additionally, MODIS data is part of a global system where as the volcanic monitoring from AVHRR is isolated to the north Pacific region. Beyond its global reach, the Urgent Request Protocol is one of the longest running programs focused on mission operations and volcanic science. Stakeholders and scientists anticipate the launch of the Hyperspectral Infrared Imager (HyspIRI), which will have a thermal infrared imager similar to ASTER on board. 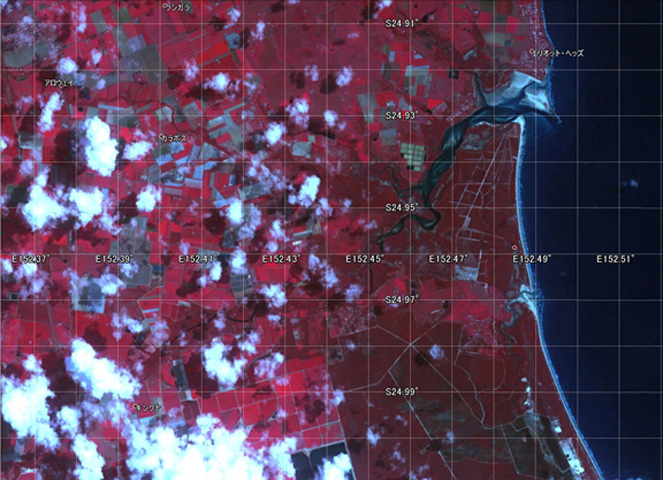 Information acquired by ASTER is used in the development of HyspIRI and future thermal infrared sensors, contributing to the extended satellite record and the next generation of Earth observing satellites tracking volcanic threats from space. Watching from their vantage point outside of Earth, satellites will continue to witness volcanic eruptions and volcanic activity. While no one satellite can see the whole picture, when multiple satellites with the ability to measure Earth’s temperature frequently or in great detail are used together like in the Urgent Request Protocol, people benefit. The strong foundation laid by the Urgent Request Protocol will allow new data from the next fleet of satellites to continue to help people prepare for volcanic incidents. Image Credit: NASA Earth Observatory image by Jesse Allen, using data from NASA/GSFC/METI/ERSDAC/JAROS, and U.S./Japan ASTER Science Team. 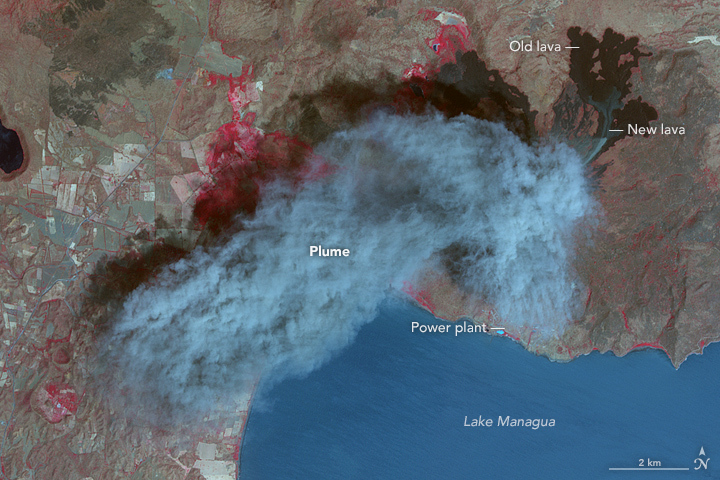 Eruption at Momotombo– The Advanced Spaceborne Thermal Emission and Reflection Radiometer on NASA’s Terra Satellite aquired this false color image of Momotombo volcano in Nicaragua erupting on March 2, 2016. 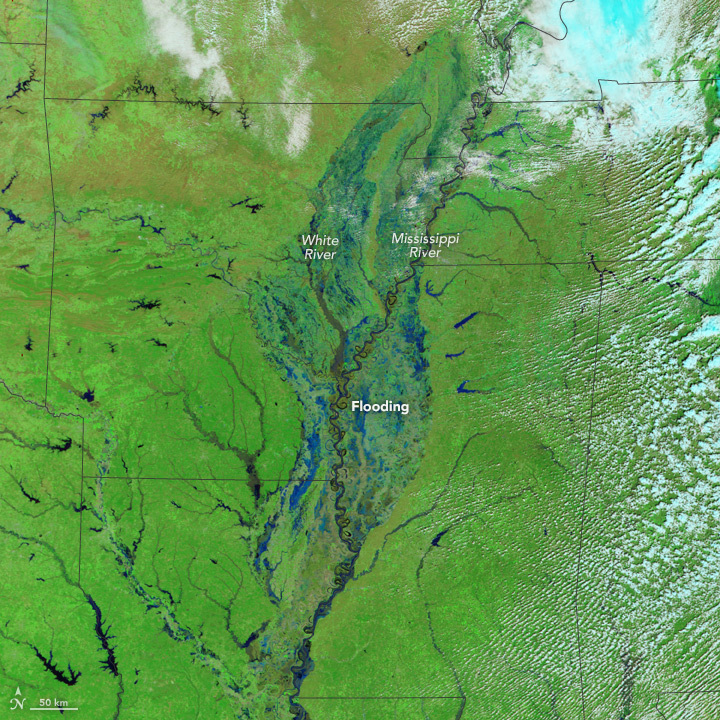 Flooding in the U.S. South– The Moderate Imaging Spectroradiometer on NASA’s Terra Satellite captured images of the flooding waters on the Mississippi River and White River in the southern United States. 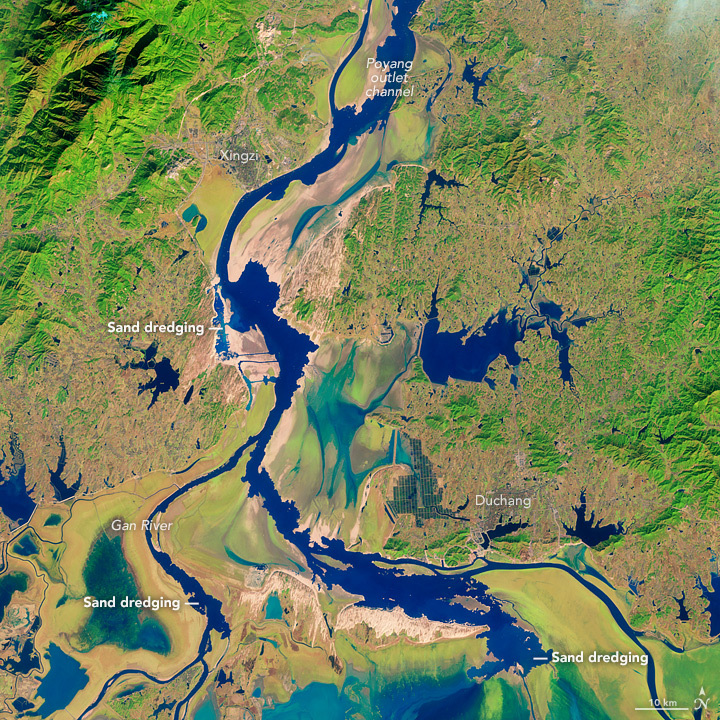 Sand Mining at Poyang Lake– As part of an effort to assess the scale of the sand mining and its environmental impacts, a group of researchers analyzed data collected by the Advanced Spaceborne Thermal Emission and Reflection Radiometer (ASTER) sensor on NASA’s Terra satellite. Using infrared data collected by ASTER in 2005, the researchers found that the lake was producing up to 236 million cubic meters of sand per year—about 9 percent of the total produced by China. The researchers estimated that the volume of sand removed was probably enough to make Poyang Lake the largest sand mining operation in the world. 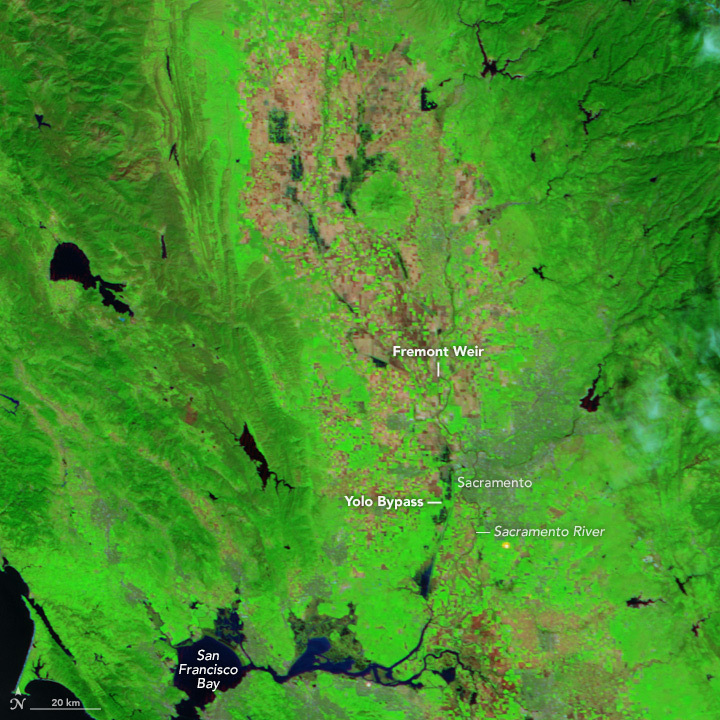 Northern California Floodway Fills– The Moderate Resolution Imaging Spectroradiometer (MODIS) on NASA’s Terra satellite captured images of the river and floodway in northern California. Storms in March 2016 brought water levels in this drought stricken region back to it’s historic average. Image credit: NASA/GSFC/METI/ERSDAC/JAROS, and the U.S./Japan ASTER Science Team. Terra and its sensors are back on line and collecting data. The ASTER team released this first light image. The area is in Queensland, Australia where the Elliott River meets the Pacific Ocean. To the south of the river is the Burrum Coast National Park, appearing deep red. The brighter red areas to the east of the National Park is farmland. North of the River is the small town of Elliott Heads with a population of less than 900 people.